It is becoming a well known fact that Innkeeper Dave is a great cook (although he is quite modest and will never admit it, no matter what the guests say). It naturally follows that he makes breakfast at the Inn. However, Innkeeper Brigette does attempt cooking and baking from time to time, which is true if you count toast. Dave: When doing individual baked egg dishes, take the eggs out of the oven just before they are done and allow them to finish baking in their hot dish. This will prevent the eggs from being overcooked and too dry when serving the egg dish to guests. 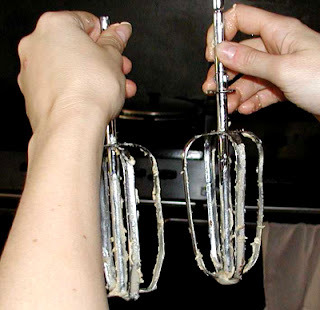 Brigette: When baking cookies, take the wooden spoon OUT of the bowl before turning on the mixer. This will prevent the mixing attachment thingys from becoming too bent (and they do bend back into shape somewhat, but not all the way, so this is a really important tip if you want to be able to make something with the mixer in the future, because it appears that if the thingys are TOO bent, they will not mix well anymore). * Disclaimer: Dave’s commercial mixer was not harmed during the making of this post. The mixer attachments above are from Brigette’s mixer (used a total of three times now by Brigette). This entry was posted in Uncategorized and tagged food and drink, innkeepers and innpugs by Inn on Mill Creek. Bookmark the permalink.